Character spotlights help you explore Seven Worlds through the eyes of its inhabitants. 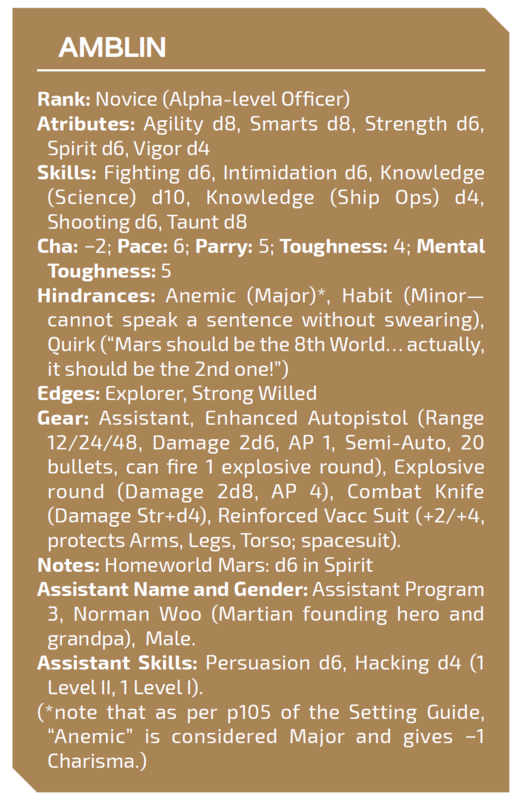 These characters are fully statted and can be used by players. You can get a PDF with Amblin's full background and a detailed character sheet at our Downloads section or at DriveThruRPG or RPGNow. Amblin Woo was born on Mars in 2150, into a proud, nationalistic family. Still influenced by the century-old memories of a time when Mars seemed to be the future next home for mankind, a small group of first generation Martians and their families maintained a strong pride in Mars. Unfortunately, fate did not seem to be on Mars’ side, first when the N’ahili arrived and shared the coordinates to the stars; then when new, Earth-like planets were discovered and settled, thus diverting resources and goodwill from Mars’ huge terraforming efforts; and finally when the comet crashed against Earth in 2133, bringing down the economy Mars was almost completely dependent on. Even today Mars is not considered one of the Seven Worlds, but instead a secondary world belonging to Earth’s star system. This irks Martians as nothing else can. Amblin Woo was born into one of these old-blood homes, and she carries this perceived slighting of Mars everywhere she goes. Her grandfather was a member of the first settler expedition to the planet and one of the founders of Mars Base, the oldest and largest settlement on the planet. Raised with a strong pride in Mars and in her family’s accomplishments in it, Amblin grew up with her family’s appetite for scientific research and investigation, combined with a rough-and-tough attitude to physical activities. A passion for exploration thus seemed to be her calling. Unfortunately, her beloved home planet never had the resources to mount scientific expeditions outside Mars, especially after the comet hit Earth and the political and economic dynamics of the Solar System changed. With Earth still recovering and in no shape to mount scientific expeditions, it fell to Concordia and Bay Jing, the next greatest powers in human space, to take the lead in interplanetary and interstellar exploration. When in 2165 a new batch of space routes was provided by the N’ahili, there was a great need for skilled explorers with a mix of scientific and physical abilities and with experience in gravities and environments outside Earth-like parameters. Thus Amblin found herself shipping out of Mars and joining a scientific research outfit in Concordia, becoming a member of one of the crack teams ready to push the limits of the frontier. For eighteen years Amblin developed her skills in interplanetary exploration, visiting many hostile and unknown star systems in far-off locations provided by the N’ahili, eventually being recognized as one of the best and most experienced explorers in human space. Her tough, hold-no-prisoners leadership style and her constant swearing became as famous as her exploration skills. She enjoyed her work and renown, and most of all loved being referred to as “the Martian explorer.” In her mind, she was proof that Martians would make a lasting, leading mark in human space after all. Then came the expedition to Ross 128b. Scientists had known that a possible habitable world orbited the star known as Ross 128 since 2017, deep in the pre-interstellar era. Since then it had been established that the planet was not ready for human habitation, but element combinations suggested there might be rudiments of early life. Thus, scientific curiosity about Ross 128b was high. But until the N’ahili shared their new coordinates there had been no practical way to visit that world. On top of that, despite being just eleven light-years away from Earth, the quickest known route to Ross 128 turned out to be a staggering nine jumps away from Concordia, far beyond the reach of even the biggest research ships. Thus the Ross 128 expedition required significant preparation, including the installation of a temporary waypoint station at WD0552-41. Finally, in 2185, when Amblin was thirty-five years old, one of the most ambitions scientific expeditions of the era was ready to begin. The Ross 128b expedition’s crew included ten experienced explorers, a team Amblin felt very comfortable with. With none did she feel more comfortable, though, than with Stefan Pinheiro, the more-than-friend whom Amblin had met several years before and who had become the closest she had to a family. Although Amblin was not the type of person who found it easy to make deep emotional bonds with anyone, Stefan might just prove to be the person that might help her out of that. The fact that he was Concordian and not Martian and yet connected with her the way he did surprised her immensely as well. When the expedition arrived at Ross 128b after a long and arduous voyage, they began preparations to go down to the rough and hostile surface and set up a small research base. After a few weeks, the team discovered the initial rudiments of a life based on chemical combinations similar, but not quite the same, as our own. They also noticed that the atmospheric ratios of several elements did not exactly match their models, suggesting something else on the planet was participating in its burgeoning ecosystem. Sadly, the team did not get to discover the source of this abnormality because on October 10th, 2185, everything changed. That night Amblin went to sleep after a tiring day of outside exploration, and later was abruptly and violently woken up by a wild-eyed and shaken Stefan. Screams could be heard from other parts of the station as well as what could only be shots fired from one of the guns in the emergency locker. When she woke up she was in the surface-to-orbit shuttle in orbit around the planet, strapped to a crew couch, alarms blaring all around her. Apparently, she had been hauled into the shuttle and launched into space by automatic pilot, and something had gone wrong during launch. All indicators showed that the shuttle had undergone severe damage (caused by what?) and could explode at any time. Amblin tried to contact the base, or get the research ship to approach via autopilot, but it was all useless. She barely got to jump into an escape pod and launch off the shuttle before it silently exploded. Escape pods are the last, desperate hope of salvation in space. By using a combination of coma-inducing drugs and lowering body temperature while keeping minimum livable conditions, escape pods have been shown, in theory, to be able to keep a human alive up to five years before the human body itself begins to fail. In any case, the energy batteries carried by the pods are certified for up to fifteen years of constant use. Thus, it was nothing less than a miracle when Amblin’s pod was recovered in 2205, almost twenty years after the expedition arrived, and she was found barely alive. Between waiting for the original expedition to return, getting organized and dealing with all the complications occurring in the Seven Worlds in the last decade of the 22nd century, a second expedition to Ross 128b could not be mounted until 2205. Besides recovering Amblin, the expedition landed and found a destroyed research base. As far as the investigation could determine, all crewmen killed each other for reasons unknown. No evidence of “monsters” or anything unusual was found, and Amblin’s reputation suffered as a result. Amblin returned to a radically different life. Her body was wasted and her health irreparably harmed by the twenty-year-long, zero-g coma. It took her years to recover, and she knows she will be a frail and weak person for the rest of her life. She became immediately famous, a “relic from another time” recovered from the depths of space, and the only survivor of a doomed expedition that failed for no obvious reason. Amblin’s personality was not suited for this sort of notoriety: After a couple of disastrous interviews, the last of which ended with her insulting the interviewer on live V-World, she was shuttled off to a dead-end research post, where her useless body, grating personality and crazy-sounding story about the mission could be safely ignored. This would not suit Amblin. Whatever else she was, she was a fighter to the end. After uselessly trying to convince people that she could be useful again, she quit and went to the only organization that would take skilled recruits regardless of their past: The Circle. By 2117 she has spent almost one year in the Circle, and can grudgingly admit she likes it. The “old woman” of the fleet (at sixty-seven years of age she is not old at all by 23rd century standards, but her ravaged body corresponds to that of an eighty-year-old) is bad-tempered, foul-mouthed, and has no obvious friends. Yet the famous fallen-from-grace explorer retains the respect of the other members of the Circle for her professionalism during missions and her undoubted skills and experience. Amblin’s deepest wish used to be to prove Mars was the best world in human space. That wish is still there but now there’s something she wants even more: To find out what exactly happened in Ross-128b before her weak body gives out. If only there were a way to know. Amblin is a thin, wiry woman with yellowish hair that looks about 80 years old. She has the tough, unfriendly demeanor of an army sergeant. Despite her constant exercise, in her recovered body she feels constantly weak. She rarely lets it show, though, and anyone who tries to help her should expect a dirty-mouthed barb in response. She is always in uniform and always on duty, even when she isn’t.